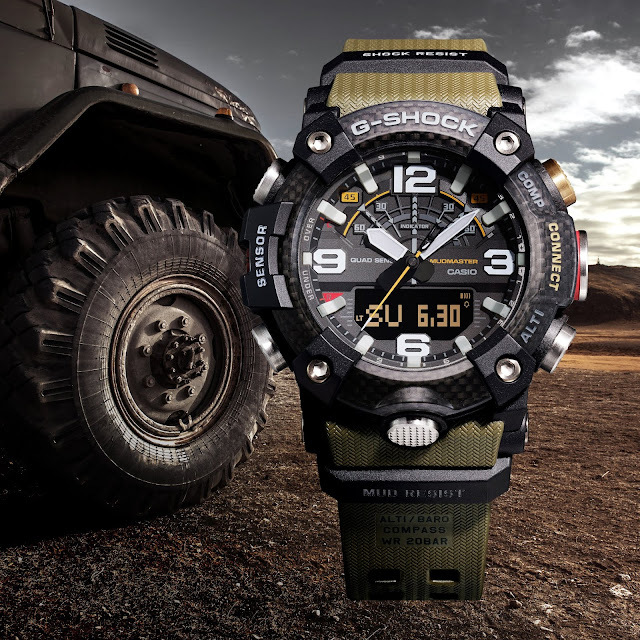 Casio G-SHOCK unveils its latest men's MUDMASTER, arriving with a new Carbon Core Guard structure to provide the upmost strength in the toughest of conditions. The new GGB100-1A3 features a green band and fine-resin back cover, as well as a black, carbon fiber reinforced resin case and carbon insert bezel to provide a tough, yet light weight structure. The special edition MUDMASTER will be on display at Baselworld from March 21-26 at the Casio booth, located in Hall 1.1 B71 & 67. The unique carbon core guard structure of the GGB100-1A3 allowed for the removal of guards that would traditionally protect the watch buttons and employs a filter to avoid dirt intrusion creating a mud-resistant structure. The model also comes equipped with a large front light button, to provide high visibility and usability. Other key features include the Bluetooth mobile link function, which through the G-SHOCK Connected app, provides a location indicator and memory, mission log memory, and automatic correction for altitude, among other features. In addition, the timepiece's Quad sensors- compass, thermometer, barometer, and step tracker - further enhance its location and step tracking capabilities. The GGB100-1A3 will retail for $350 and will be available for purchase beginning in August.